Today we unveiled more details on the numerous accommodation choices on Mardi Gras, which will feature more than 180 suites across 11 styles, including the new premium category Carnival Excel suites with select amenities and access to a new resort-style, open-air enclave called Loft 19. Carnival Excel Presidential Suite –Two Presidential Suites – the largest in the fleet – located on Deck 17 that feature spacious living, dining and sleeping areas along with the fleet’s most expansive balconies with vast sea views, large sunbed and lounging areas, as well as a private outdoor hot tub and shower. These suites also include access to the spa’s thermal suite and the Havana pool area. Carnival Excel Aft Suite – Twelve suites overlooking Summer Landing and boasting separate living rooms and bedrooms with large wraparound balconies offering impressive ocean views, as well as a private outdoor hot tub and areas for al fresco dining and relaxing. 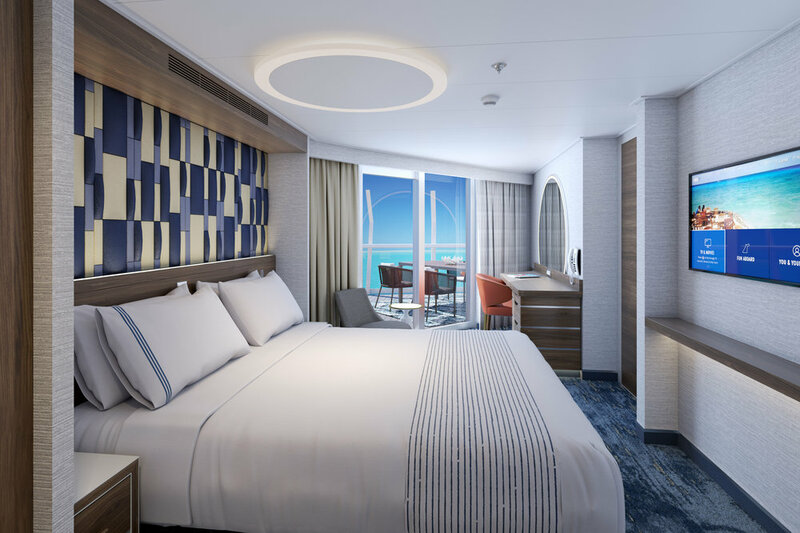 Carnival Excel Corner Suite – Twelve suites on the port and starboard sides of the ship featuring separate sleeping and lounging areas, a wet bar and wraparound balconies with lounging and dining areas. Carnival Excel Suite – Six suites on Decks 10, 11 and 12 with sleeping, dining and relaxing areas. The spacious balconies include loungers and a dining area. 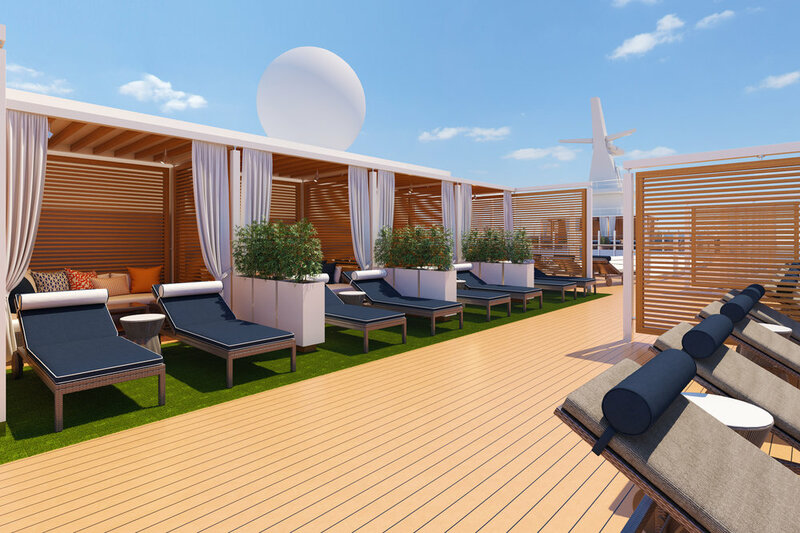 Located on the ship’s highest deck, Loft 19 is a brand new concept for Carnival – a secluded retreat modeled after the world’s finest resorts with full bar service, a private pool surrounded by sun loungers and spacious cabanas, available for rent. Cabanas are fully stocked with beverages, plush robes and chilled towels, fresh fruit, lunch delivery and dedicated concierge service. Carnival Excel suite guests will receive priority when reserving Loft 19 cabanas. Ocean Suites –separate sleeping and lounging areas with ergonomically-friendly design. Extra-roomy Family Harbor Suites – nautical décor, large-scale windows and toddler benches. Cloud 9 Spa Suites – with special spa privileges such as two fitness classes, access to the ship’s Thermal Suite and a scrub kit. MIAMI (AP) — A federal judge threatened Wednesday to temporarily block Carnival Corp. from docking cruise ships at ports in the United States as punishment for a possible probation violation. The Miami Herald reports U.S. District Judge Patricia Seitz said Wednesday that she’ll make a decision in June, and she wants company chairman Micky Arison and president Donald Arnold to attend that hearing. Despite this, prosecutors say ships have dumped grey water into Alaska’s Glacier Bay National Park, prepared ships in advance of court-ordered audits to avoid unfavorable findings, falsified records and dumped plastic garbage into the ocean. The company has acknowledged these incidents in court filings. In good news for travel agents, Carnival Cruise Line is kicking off a new, year-long promotional campaign entitled, “WUATA – Why Use a Travel Advisor,” designed to help travel agents attract new clients and deepen the loyalty of existing clients. This multi-faceted initiative will include everything from social media posts to high-profile WUATA Parties in specific cities. Those community events will bring clients and industry experts together to promote the travel agent community; they'll be co-sponsored by the American Society of Travel Advisors (ASTA) and Cruise Lines International Association (CLIA). “The proof is in my tattoo that Carnival is deeply committed to the travel agent community, and by introducing WUATA we’ll be able to share our passion so travelers gain a comprehensive understanding of the benefits of using a travel advisor,” says Adolfo Perez, Carnival’s senior vice president of sales and trade marketing, who proudly sports a tattoo designed to show his support of travel agents. “Through WUATA, Carnival becomes the first cruise line to dedicate a year-long campaign focused solely on promoting the value of travel advisors, and we’re excited to get on the road to support the growth and success of our agent partners,” says Perez. Certainly, the cruise industry’s portfolio of cruise products has become much more complex, which cruise lines say makes it critical that consumers sail on the right product -- the cruise that best matches their personality and vacation style. For first timers, in particular, the choices can be daunting. Carnival wants to ensure consumers use a professional travel agent when booking their vacation. As part of the campaign, agents can expect to see social media promotions, contests, exclusive merchandise, giveaways, text alerts and WUATA Word, an innovative crowdsourced word cloud that will grow throughout the year as the movement expands. How many travel agents does Carnival work with on an annual basis? Perez says that Carnival has 100,000 or so agents in its database. “There’s probably about 30,000 agencies" represented, he adds. Revenue from each agency varies greatly. Some might not work with Carnival much, such as selling only one or so cruises a year, perhaps not the next, and then selling more the following year. Many others, though, sell many more cruises on an annual basis or are top Carnival producers. Perez says many are independent agents working with host agencies or home-based travel advisors. Clients and travel advisors can opt in to receive text alerts about new features and tools from the WUATA program throughout the year by texting “WUATA” to 866-Go-WUATA. The alerts will also cover the latest news, contests, offers and more. When you are looking for a great Travel Consultant/Advisor, be sure to contact Gino's Travel Agency. WaterWorks: Featuring a 203-foot-long AquaTunnel slide and Carnival’s signature 212-foot-long Twister slide along with a 75-gallon PowerDrencher tipping bucket and SplashZone area for kids. Bonsai Express: the success of the full-service Bonsai Sushi restaurants has spawned this casual spot, featuring a mouth-watering array of sushi, sashimi, rolls and more. Mini Golf Course: A nine-hole miniature golf course has been relocated to Deck 11, providing a fun and relaxing pastime for families to enjoy in the fresh sea air. Re-Branded Deli: Located on Deck 9, the newly expanded Deli offers a tantalizing menu of piled-high sandwiches, paninis and traditional sides. These complement the wide array of popular experiences on board Carnival Freedom, including Guy’s Burger Joint, the poolside BlueIguana Tequila Bar & Cantina, RedFrog Rum Bar, along with favorites like the steakhouse, Punchliner Comedy Club, the Alchemy Bar, and the RedFrog Pub. Family-friendly options include Seuss at Sea operated exclusively with Dr. Seuss Enterprises that includes the Green Eggs and Ham Breakfast with The Cat in The Hat and Friends and a reading venue called Dr. Seuss Bookville, along with fun supervised programming for kids ages 2-17. Carnival has partnered with Michael’s, the largest arts and craft retail chain in North America, to bring creativity to the seas aboard our 26 ships! As our exclusive arts and crafts provider, guests of all ages will have the opportunity to engage and create together through the interactive “Make It With Michaels” experience featuring keepsakes they can take home. In partnership with Lakeland, Fla.-based Brew Hub, we became the first cruise line to can and keg our own private labeled craft created by our in-house brewery teams aboard Carnival Vista and Carnival Horizon, led by VP Beverage Operations Edward Allen and Brewmaster Colin Presby. Media and trade partners gathered in RedFrog Pub aboard Carnival Magic to celebrate this cruise industry first! The three beers, ThirstyFrog Caribbean Wheat, ParchedPig West Coast IPA and ParchedPig Toasted Amber Ale, are now available on all 26 ships and at all private destinations. ThirstyFrog Caribbean Wheat – an unfiltered wheat beer with flavors of orange and spices. ParchedPig West Coast IPA – the embodiment of a traditional West Coast India Pale Ale, this hoppy, intense beer is loaded with bitterness with a bright flavor profile and distinctive aroma of citrus and pine. ParchedPig Toasted Amber Ale – highlighted by its rich amber color and notes of toasted caramel and biscuit, this beer is well balanced, smooth and highly drinkable. Renowned New Orleans chef Emeril Lagasse will open his first restaurant at sea in the French Quarter zone of Carnival Cruise Line's new Mardi Gras ship. To be called Emeril's Bistro 1396, the restaurant will serve items such as fried oyster po-boy sandwiches, muffaletta sandwiches, seafood ceviche and Emeril's signature barbecue shrimp. The 66-seat restaurant is the first featured attraction to be announced for the French Quarter, a new concept not currently on other Carnival ships. Pricing will be a la carte from $2 for starters to $12 for entrees. "It's open to the promenade in the same way that Bonsai Sushi is, and gives people the option while they're eating to still be part of the action in the surrounding space," Carnival president Christine Duffy said. Lagasse will bring a pedigree to Carnival's Cajun culinary efforts, plus lots of experience opening eateries in tourist-friendly locations such as Orlando and Las Vegas. Born in Massachusetts to a French-Canadian father, he originally earned his kitchen stripes by succeeding Paul Prudhomme as executive chef of Commander's Palace, one of the best-known restaurants in New Orleans. After eight years, he left to open Emeril's restaurant in New Orleans in 1990 and now is the proprietor of 11 restaurants. Lagasse has starred in several TV cooking shows and his name is on a variety of pasta sauces, spice blends, rib rubs and kitchen knives. "I've developed restaurants all over the country, but to create my first restaurant at sea -- on a ship named Mardi Gras with its own French Quarter, no less -- was an opportunity I simply could not pass up," said Lagasse. In addition to New Orleans-style entrees, the menu for Emeril's Bistro 1396 includes desserts such as Bananas Foster and lemon ice box pie. Sides include Creole potato salad with diced scallions and red beans and "jazz-man" rice. A breakfast will also be served with a shrimp Creole omelet or shrimp and grits. The 1396 in the name of the restaurant is a reference to the hull number of the Mardi Gras at the Meyer Turku shipyard, Carnival said. Lagasse is one in a spate of name-brand chefs to be announced by cruise lines in recent weeks. Celebrity Cruises struck a partnership with New York chef Daniel Boulud in February. MSC Cruises recently reeled in Raymond Blanc, chef at the Michelin two-star Le Manoir aux Quat'Saisons hotel restaurant in Oxford, England. Now under construction, the 5,200-passenger Mardi Gras is due for delivery in August 2020. Carnival's Newest Ship Mardi Gras is open for Bookings! The Carnival Mardi Gras will be the largest Carnival ship ever constructed, and the first cruise ship in North America to be powered by liquified natural gas (LNG). Currently, Carnival is building a new ship terminal in Port Canaveral where she will be ported. Mardi Gras will also feature the first ever roller coaster at Sea BOLT...with Exhilarating Twists, Turns and Drops that are enjoyed 187 ft. above sea level. Mardi Gras has 6 distinctive theme zones: 1) Grand Central, 2) French Quarter, 3) La Piazza, 4) Summer Landing, 5) Lido, 6) and the Ultimate Playground. 7 day Eastern & Western Caribbean itineraries from Port Canaveral starting 10/16/2020. Gino's Travel Agency is currently talking reservations. Contact us today to get on board the Carnival Mardi Gras! Beginning May 2019 sailing 4 & 5 day cruises to Mexico. This is Carnival's largest ship sailing on short cruises. Carnival Breeze is a sister to Carnival Magic (another awesome ship)! Thirty of her 5 day cruises will go to Costa Maya and Cozumel, while the others will go to Progresso and Cozumel. Gino's Travel Agency is currently taking reservations for Carnival Breeze. Call us today to get on board! Hey Texas! We have Carnival's 2nd largest ship sailing from Galveston! 7 day Western Caribbean (Sunday - Sunday) - Cozumel, Grand Cayman, Montego Bay. 7 day Exotic Western Caribbean (Sunday - Sunday) Mahogany Bay, Roatan; Belize, Cozumel. In addition, there will be a few unique 6 & 8 day cruises in April and May 2019. Gino's Travel Agency is currently taking reservations for Carnival Vista. Call us today to get on board. Carnival's Wi-Fi Packages - Fast and Simple + Pre-Book online! - You can now purchase Wi-Fi packages prior to your cruise. Social: Unique in the cruise industry and provides unlimited access to Twitter, Facebook, Instagram, Linkedin, Pinterest and other popular sites. Pre-Cruise: $6.80 per day. On-board: $8.00 per day. Value: Includes unlimited access to the Web for checking email, sports scores, weather updates and a wide range of other applications. Pre-Cruise: $10.20 per day. On-board: $12 per day. Premium: Provides the fastest available connection speed and allows access to some streaming video services. Pre-Cruise: $14.45 per day. On- Board: $17 per day. Cheers! Beverage Program now includes a greater variety of non-alcoholic drinks as well as higher quality brand-name spirits and wine by the glass. Any drink that costs up to $25 per serving is included. Woohoo! Pre-purchase: $51.95. Purchase on board: $56.95. Cost is per person, per day, + 15% gratuity. Bottomless Bubbles Unlimited Soda Program: Child rate (17 years and under) $4.95. Adult rate (18 years +) $7.50 per person, per day + 15% gratuity. Carnival HUB New Features! "New Pre-Cruise Functionality"
With the HUB App's new pre-cruise capabilities, you can now manage your bookings, complete online check-in, and conveniently purchase a wide variety of items and experiences before departure, including excursions, spa treatments, specialty dining reservations, Wi-Fi packages, and Fun Shop orders for stateroom delivery. Expanded "Pizza Anywhere" Feature has been added to nine other ships, including Galveston ships - Carnival Vista and Dream! You can satisfy your pizza craving at anytime with the touch of a button to place your order, click on your location on the map, and take a selfie to I.D. yourself. Cost is $5 and pizzas are cooked to order and delivered hot to wherever you are on board. Carnival Radiance - 6/7/9 day from NYC, Norfolk and Port Canaveral. Gino's Travel Agency is currently taking reservations for any of the above exciting itineraries. Call us today to get on board!